Join Metro for a one-hour live chat on Tuesday, April 29 at 6 p.m. to discuss the upcoming full street closures that will take place due to Crenshaw/LAX construction. Project director Charles Beauvoir will answer questions regarding travel options for pedestrians, motorists, business owners and the general public during the Crenshaw Boulevard closures. Crenshaw Blvd. will be closed between Martin Luther King Jr. and Stocker Street from 10 p.m. Friday, May 2 through 1 p.m. Saturday, May 3, as work begins on the Crenshaw/MLK underground station. 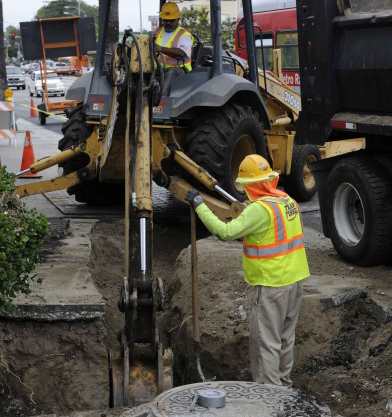 On Friday, May 16, a second full street closure will take place on Crenshaw Blvd. between Exposition Boulevard and Rodeo Place. The full street closures are required to implement traffic rerouting for upcoming construction activities such as utility relocation, pile installation, decking and excavation. The live chat will be hosted on Reddit. You can leave advance questions on the chat page once it is live, email your questions to CrenshawCorridor@metro.net or call the project hotline 213.922-2736. If you’d like to call in via phone during the chat, call 213.922-4601 to submit your questions. All questions will be answered from 6 – 7 p.m. on the Reddit page.